Heads,Professors,Associate Professors,Assistant Professors,Non Teaching Faculty jobs vacancies. Interested and eligible job aspirants are requested to apply with in 10 days.Check out further more details below. 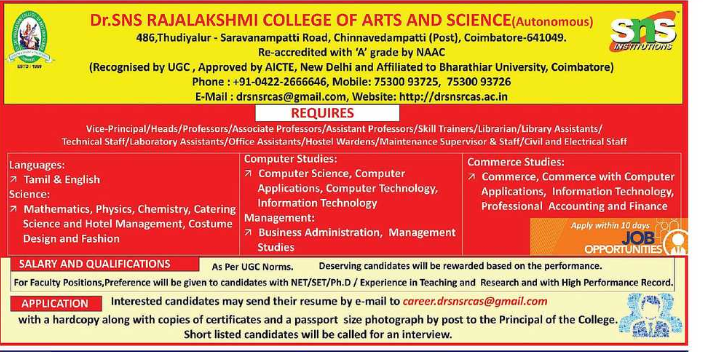 Name of the College: Dr SNS Rajalakshmi College of Arts and Science, Chinnavedampatti,Coimbatore. 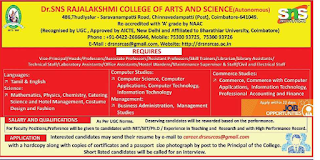 About College: Dr.SNS Rajalakshmi College of Arts and Science, Coimbatore was established in 1999 under the reign of SRI SNS CHARITABLE TRUST. The TRUST was established in the year 1997 with a philanthropic outlook of serving the society in the fields of education, health and industry. The trustees, with rich experience and wide knowledge in industry, medicine and higher education, dedicate themselves to work for the development of the society in these fields by way of starting various charitable institutions in a phased manner. For faculty positions,preference will be given to candidates withNET/SLET/Ph.D. Preference will be given experience in teaching,Research and with high performance record. Deserving candidates will be rewarded based on the performance. How to Apply: Interested and Eligible candidates may send their resume by email with a hardcopy along with copies of certificates and passport size photo by post to the Principal of the College.